Use Hidden Pictures as a prepared or spontaneous quiz where students answer your questions to slowly unveil a hidden picture. Ask any questions you like, in any subject. The questions are up to you. 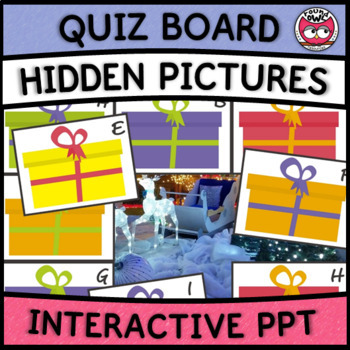 Hidden pictures is an animated PowerPoint where all the hard work is done for you! 9 squares cover a photograph. When individual squares are clicked, they disappear, revealing part of a picture. Perfect for interactive whiteboards or data projectors. And even better!!! Buy either Hidden Pictures 1 or Hidden Pictures 2 and receive Hidden Pictures - Christmas for free. Try Hidden Pictures 3 if you have older students. 1 animated PowerPoint show containing 10 hidden pictures (photographs) about Christmas. 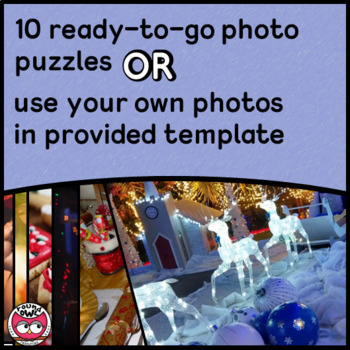 Want more Christmas Quizzes? Check out Pass the Present. If you enjoyed this product, please leave a positive review and gain credits for future purchases!